The unanticipated during a delivery tour is part of your routine. With Citodi, tours are adapted in the best possible way, in real time and regardless of the hazards of the terrain! You carry out delivery operations every day, at an intensive pace. In the field, your delivery staff must ensure the timely delivery of their packages, while reacting as well as possible to unavoidable events (a late customer, an accident on the route, a travel error, etc…). 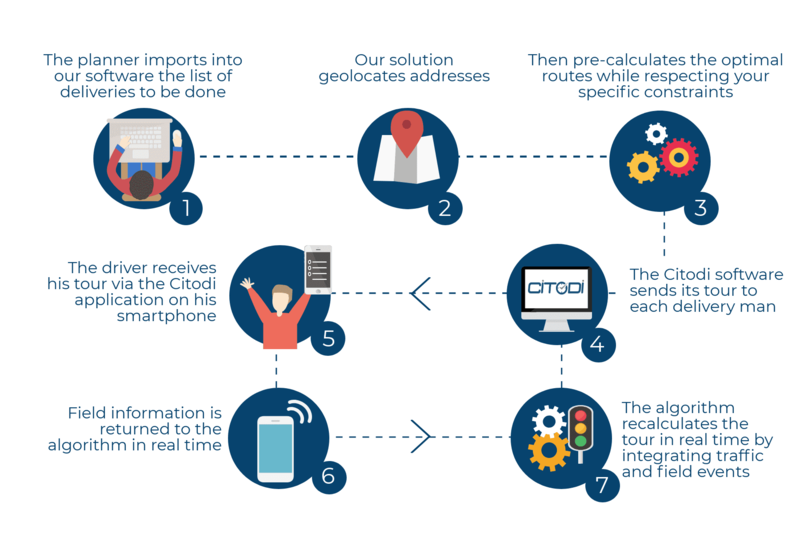 Thanks to Citodi’s algorithms, offer your delivery staff an efficient and responsive route optimization assistant! The Citodi solution, available via an application, indicates to each of your deliverymen his delivery tour plan. The driver or operational has the possibility to interact with the algorithm. If a customer’s delivery time slot needs to be changed on the fly, the application immediately adapts the tour to make further deliveries in the meantime. If the driver has taken the wrong route, the application suggests another destination if it is more efficient. But above all, the driver remains in control of his tour, he can impose his choice at any time on the algorithm that will adapt to it in a few seconds! You respect all your delivery slots, and if a delivery is impossible in time with the current position of the deliverers, the system tells you as soon as the order is placed. Your drivers benefit from the support of the real-time algorithm that suggests the best possible adaptations for ever faster decision-making. Thanks to the computing power of the Citodi solution and the performance of our algorithms, your tours are recalculated every second to remain optimal throughout the day.